Attempts to replace it with a UN Corp “Regional Government” have thus far been successfully rebuffed and prevented. longer apply or require tweaking to make them work in this altered scenario. and have their records established via the old Muni process. They have to be recognized as civilians. It will require a lot of effort to correct and some confusion is unavoidable. Just remember the key points — you are no kind of “citizen” but are a civilian non-combatant “national”. of your birth state recorded with the local Land Recording Office. A Corrected Deed to your Name and Estate –land, etc., can be used to the same effect. The most urgent thing people need to do besides cleaning up their own political status records is organize their county and state jural assemblies. The national level quorum is growing and will soon be able to redress grievances at a national level. The National Assembly Thursday night conference call is at nine o’clock p.m., EST, 1-712-770-4160, access code 226823#. First hour is assembly roll call and business. The second hour is general chat and education. For those who have not participated in your county and state assembly but want to participate please send an email to contentmanager1@yahoo.com with your state in the subject line. You will be connected with your state coordinator. The national assembly has a full website and forums packed with history and information. You are welcome to register and participate. The old website 1stmichiganassembly.net and the hotline phone number are now obsolete and no longer used. The Michigan General Jural Assembly created and supported the national level assembly website and conference call for the people to return to self governing. Our country as a whole is indeed facing an emergency of sorts. status and organize their county jural assemblies. There is not a moment to waste. Your destiny and the destiny of your country depends on your willingness to set the records straight and organize the local county government you are owed. international transactions and silver for domestic purchases. We are told that the United Nations (UN) is an international organization that aims to facilitate co-operation through social progress, economic development, international security and international law. They promote themselves, and are outwardly promoted as a reputable body that deals with peace, security, development, human rights and humanitarian affairs. With this being the case it’s no surprise to see the UN at the forefront of all international conflict and instability, since these exact events give them the ideal atmosphere to promote themselves as bringers of all that I previously mentioned. Throughout history, authoritative figures have always tried to paint a perception of themselves in hopes of influencing and brainwashing the masses into a desired agenda. By promoting themselves, I am referring to the UN’s use of mainstream media networks, like CNN. CNN is owned by Time Warner (1), which is owned by JP Morgan Chase and Company and Dodge & Cox Inc, to name a few (2). It also has a select group of direct holders, like Jeffrey L. Bewkes. Mr. Bewkes sits in the head office of Time Warner’s two towers built in 2001 -buildings purposely built to resemble the once standing World Trade Centers of New York City. Bewkes is also a member of The Council on Foreign Relations (CFR) (3),which is headed and funded by the Rothschild and Rockefeller families (4)(5). In fact a large majority of mainstream media network owners are all members of the CFR, as well as the trilateral commission. Another example of this is Richard D. Parsons. who served as Time Warner’s Chairman of the Board from May 2003 to January 2009. Currently Mr. Parsons is a member of the Board of Trustees and is a Senior Advisor to the Rockefeller Foundation(6). I could even go on to look at Frank J. Caufield, another major direct holder of Time Warner Corp, who is also a member of the CFR(7). Let me remind you again, that CNN is owned by Time Warner Corp, which is owned by a number of individuals and corporations that are run by a few families. These families hide behind the corporations they run, using the employees and politicians they hire to do their dirty work. Why we continue to hand our perception of what is happening on the planet to a select few who show no regard for the human race is beyond me. As a child, I did not understand how a human being could have such negative intentions, and create so much conflict through the use of trickery. To this day I still believe that a human being cannot do what these “governing bodies” and multinational corporations do. Whether or not it holds the same effect on you, I hope the connections above at least raise an eyebrow for you. There is no need for me to point out the JP Morgan (major institutional holder of Time Warner)/ Rockefeller connections, which also played a big role in the creation of the Federal Reserve System in 1912. So what does all this have to do with the United Nations? Well, the same ones that own all of our mainstream media networks, also own, run and created the United Nations. The owners of the United Nations use their media networks to influence the perception of billions of people. Not many people know that our mainstream media networks are owned by less than 5 multinational corporations, and all of these corporations have ties to the Rothschild and Rockefeller families. If you dive in even further, all of the same corporations are directly related to suppressing clean energy technologies, like General Electric. You can find out more about free energy suppression here. More ties can be made in the food and medical industries as well. Our planet is owned by a small group of families and the corporations they run, this is no longer a secret, no longer a conspiracy theory. It’s becoming evident that these “people” do not have our best intentions at hand. The forerunner to the United Nations, was the league of Nations. It was created under the treaty of versailles in 1919 (8)(14). Many believe the idea of the UN’s creation was due to the second world war, it wasn’t. A plan for global control through a well disguised body of peace started long before 1945. The League of Nations was an intergovernmental organization created at the Paris peace conference that ended the First World War. Development of international organizations due to conflict is a way of trickery. The UN was created in 1945 as a result of World War 2. Anytime there is global conflict, something is created out of that conflict, to give the illusion that whatever is created out of that conflict is a direct solution to that conflict. Have you ever thought that the ones who created the conflict, are doing so in order to propose the solution? What a scam that would be, wouldn’t it? What a trick, using and controlling our will. Handing our will over to those who look to take advantage of us, to those that are not in service to others, but to themselves. The League of Nations was created by the Rockefeller Family, they were responsible for funding the entire operation(9). At the same time, the International Labour Organization was developed, which is and was heavily funded by the Rockefeller and Rothschild families(10). It is clear that the Rockefeller and Rothschild families both created the United Nations, without them the development of this global organization would not be possible. The Same Groups That Funded Nazi Germany Created The United Nations? Both Sides of the War Were Funded by the Same Group? A key question we must ask ourselves when it comes to international global governing bodies is, who is in charge? Who is making the decisions? What connections can be made between the United Nations and the other major governing bodies of planet Earth? How often do we ask these questions? And how often do we make the connections? If the United Nations was created for peace and stability in conflicting War time, why would the same parties fund both sides of the war? Was it just for profit, or did they want to create War, to create government bodies that would control our entire planet? The United Nations has branched off into the World Health Organization, which has other branched within it like Codex Alimentarius and the Food and Drug Administration. I’m talking about Paul M. Warburg, a German-born banker, who was an appointed member of the Federal Reserve System, on the board of governors(11). Isn’t the Federal Reserve a United States entity? He was heavily involved with the creation of the Federal Reserve, and his family was heavily involved with I.G Farben. I.G Farben was the largest chemical company in the world during its time, and one of the largest industrial booms next to the Rockefeller’s Standard Oil Company, and General Motors. I.G Farben was responsible for numerous war crimes, supplying the Nazis with weapons and even funding the Nazi party(12)(13). Why would the federal reserve system and the Rockefeller’s be involved with I.G Farben? Isn’t the federal reserve an American entity? Did they not fund the United States as well? Paul Warburg and his family were involved with the creation of the Federal Reserve, the Warburg family headed I.G Farben, a company that supported the Nazi movement. So what is going on here? There is a lot of evidence to show that both sides of World War II were funded by the same people, so I think a “fast one” has been pulled over our eyes. The Federal Reserve is still in tight with the Warburg family, as they have transformed themselves into several multinational corporations and financial institutions, like Warburg Pincus(15)(16). It’s no secret that the Bush family also heavily profited from the war. Did you know that the Bush family also had members connected to the federal reserve, and that the Bush family is also very close to the Rockefeller family?(17). It’s not a secret that the presidency has always been connected to the Federal Reserve. Prescott Bush even worked for the Nazis, he worked with and profited from companies that were funding Hitler. With all of these connections, it is easy to see how the real founders of the United Nations (if you follow the money) were connected to many inhumane acts. So what makes you think it has stopped today? What if the United Nations give you the illusion of a peace making body, in order to drive chaos, fear, and to fulfill an agenda that started long before we were all born? How can the UN protect us against mining corporations for example, that commit atrocities all over the world, when the same ones who created the UN own all of the major mining corps, like the Rockefeller Hughes Corporation(18). I’ve provided sources for all of my claims, at the same time I like to leave a few out to inspire the readers to do some research. Feel free to look into the Bush connections yourself! Keep in mind, I’ve used only a few examples and connections in this article, there is a tremendous amount that you can make on your own if you are sparked to further your research. One aspect of the current consciousness shift is waking up to new facts and possibilities of what really happened in our recent human history. Many people take different paths to awakening, but in the end it all leads to one thing: we have to be the change we want to see. We’ve seen a lot of turmoil throughout the years on this planet, and in turn it’s created a very dense energetic state for planet Earth. More people are starting to find peace, they are experiencing more joy and desire change for all on planet Earth. Through awakening, we are changing the vibrational frequency of the planet. We’ve been blind to many things for thousands of years. We are living in the age of transparency, everything has presented itself for us to see from the “darkest” experiences to the “lightest”. Either way you look at it, everything that has and is playing out on planet Earth is all an experience for the human race. Events happen, in order to jolt us into waking up to truth. 9/11 for example, woke many up. Whether it’s the truth about hemp, the federal reserve, the illuminati, extraterrestrials, spreading love, or anything else, the age of transparency is leading to a new truth within billions of people, and that truth is love. Love is required as a necessary building block for a new world. We are responsible for what is happening here, when we awaken from our sleep, I’m sure we won’t let continue what we’ve let continue for so long. No longer will we be used to uphold a system that does not resonate with us, instead we will create a new one that makes the old one obsolete. There are multiple sources that go beyond mine, I could have used many more. Please feel free to do your own research to further verify some facts. The United Nations released Agenda 2030, or what it’s calling a “new universal agenda” for humanity. Many are calling this the first public declaration of the long feared “New World Order” or the beginnings of a totalitarian one world government. Whether or not one believes in the so-called conspiracy theory of the New World Order, the phrase “new universal agenda” and the phrase “New World Order” share the same linguistic meaning. The question is then, are they one in the same? Originally a plan called Agenda 21 was released by the UN with a primary focus solely on environmental issues. That plan has now morphed into Agenda 2030 and is being labeled “Agenda 21 on steroids.” This new agenda now addresses virtually all areas of human activity and is truly a blueprint for global governance. At first glance, this agenda appears to be combating every serious problem on the global stage. Yet when one delves deeper into the logistics of the plan, it becomes clear that the act of suggesting what should be done, and having a solution to a problem, are two very different things. To throw up a lofty goal such as, “End poverty in all its forms,” is substantially different from having an actual solution to poverty itself. This is incredibly vague and is something that no one will disagree on, which is the point. Yet again, actually making this happen is the same problem as before and places the agenda directly back in square one. It is as if to suggest that until now, no one has officially decided to “end poverty,” and now that a global agenda has been declared, the poverty-ending “plan” will be shared with all in need. This raises the obvious question: What happens to the countries that decide not to participate? Will their country be exempt from the universal poverty-ending plan? As far as the media is concerned, these topics are not very important. It is quite odd that a plan of such relevance, such magnitude, is being completely disregarded by the mainstream media. The entire planet is going to be committing to work toward seventeen mutual goals and there has been a complete media blackout in the United States. Most Americans are unaware of this worldwide agenda, and that in itself should be alarming. A lack of reporting on a specific topic by the corporate media is the modern tell-tale sign of a topic this is actually news-worthy. When there is a media black-out on a story or event, it is most likely a subject worth paying attention to. To collectively combat these major issues (from a citizen level) as a world-wide entity, is a step in the right direction. However, these bullet point goals and their ambiguous means in which to reach the end result, have endless openings to be abused by the very same officials in which abuse every opportunity that is presented to them. This country’s history is riddled with political deception and manipulation of the public, and this worldwide plan has vast opportunity for the corrupt to follow suit. 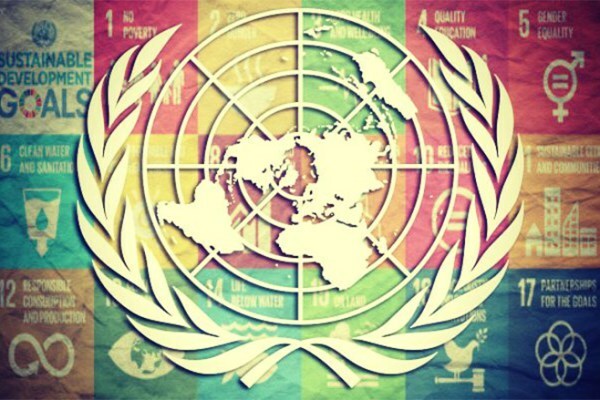 Below is a comprehensive list of Agenda 2030’s goals and how these goals will be approached from the corrupt level of the United States political system; which in turn will dictate the development of the new universal order. “The UN document promises that this plan will ‘transform our world for the better by 2030,’ and yet very few Americans have even heard of the 2030 Agenda at this point. “Instead, most of us seem to be totally obsessed with the latest celebrity gossip or the latest nasty insults that our puppet politicians have been throwing around at one another. And don’t forget the One World Religion under the One World Pope!